The Future is Here – Get Some! With much anticipation related to the Apple Watch I visited our local Apple Store, with my eldest son and wife, on the first day it was possible to try one on and take it for a test ride. To my delight, the Apple Watch comes in 2 very reasonable (non-gaudy) sizes! That was really all I needed to see. The rest of the tour, provided by the awesome Apple employee, was simply icing on the cake. I was hooked. He asked if I wanted to place my order now. I declined, because I wanted to think “at least a little while” about it. My wife, son and I then went out to dinner. After just a little thought and conversation I decided to pull the trigger and ordered it from my iPhone. I chose the larger size in the blue sport model. Within 5 minutes my son had ordered his (the black sport model). We were immediately notified that our watches would ship end-May, early-June. Not too bad, considering what we had read about the “possible” wait time. We aren’t sure why this happened. My guesses are that it is because the blue sport model isn’t in as high demand as the more conservative black model and/or because I have a business account with Apple and they prioritized me accordingly. Either way, works for me. I run outside…Did they leave a note on the kitchen door? Nope. How about the front door? Nope. At this point, I’m about to chase down the UPS truck – I’m here, I’m here! Realizing this probably wasn’t a good idea, I reserved myself to the fact that either it will be delivered by another UPS truck or maybe my wife is playing a trick on me. Upon going upstairs I ask: “Come on, did they deliver my watch?” She cracked up. There it was!!! As I’ve written before, unpacking a new Apple product is like opening a box of fine jewelry. Only in this case you get something truly functional! Within just a few short minutes I had it lit-up, connected to my iPhone and integrated into my life. One of the things I had read about the Apple Watch, which some were complaining about, is that you now will receive numerous alerts on your wrist and it becomes a major distraction. Like most things in life, it doesn’t have to be this way. 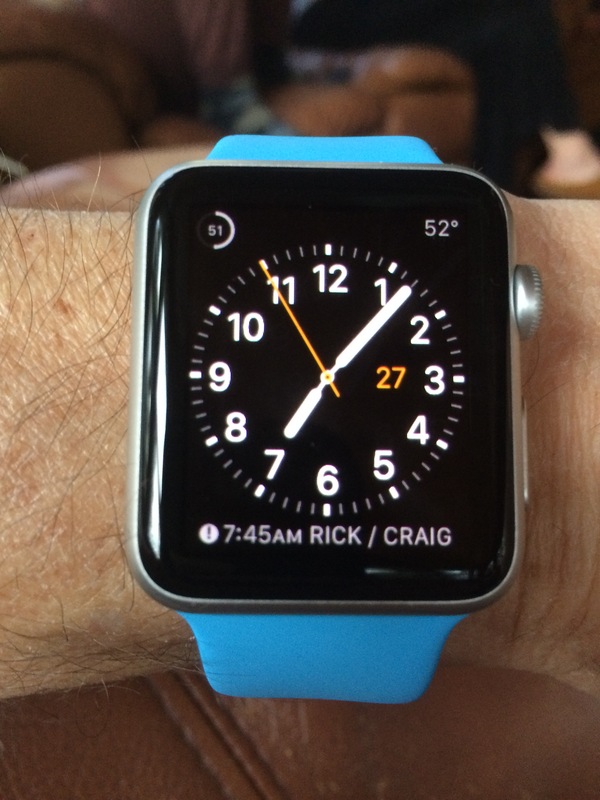 People: take control of your Apple Watch! There are very simple settings that you can use to control what, if any, alerts you receive on your wrist. So there! When my phone rings I must either pull it out of my pocket or find it on the counter to see who is calling. With the Apple Watch I just glance at my wrist and accept or decline the call. And, I can even take the call ON the Apple Watch if I choose, and talk to the caller through the watch. When I receive a text I can glance at my watch (vs. hunting down the phone) and respond via the watch. This includes custom responses I can set or I can provide my response via voice and hit send. I can see it!!! My “old” Citizens (solar-powered) watch is pretty nice but I can’t see the date. My contact lenses have been failing me recently 🙂 And, this makes me realize that “old” watches are now merely jewelry vs. the Apple Watch which adds productivity to my life. iPhone = Server / Apple Watch = Client – While it may not be entirely there yet, it is coming! And, to be clear, it isn’t a watch issue. The apps need to catch-up. Said another way, there are MANY apps I can now run from my wrist with my iPhone in my pocket. The iPhone is doing the “heavy lifting” and the watch is the user interface. There is so much potential here it is unbelievable. And, I know I’ve not even scratched the surface yet with what the current possibilities are. And, finally…I own Apple stock and am doing my best to promote their products. Which, is not hard to do. If you are a “user” you know exactly why they are the largest company from a market capitalization perspective (currently at $772 billion). An article I read today on Yahoo! Finance (“Here’s how much Apple earns more than everyone else“) provides stats that clearly demonstrate Apple took in more revenue in recently reported quarters than Exxon-Mobil, Wal-Mart and Microsoft – COMBINED! People LOVE their products. So, that’s it for now, based on the last few hours. I’m looking forward to day-1. I’ll report back at some point in the future if/when there is anything material to report. In the meantime, place your order. This is NOT a passing fad. The future is here!